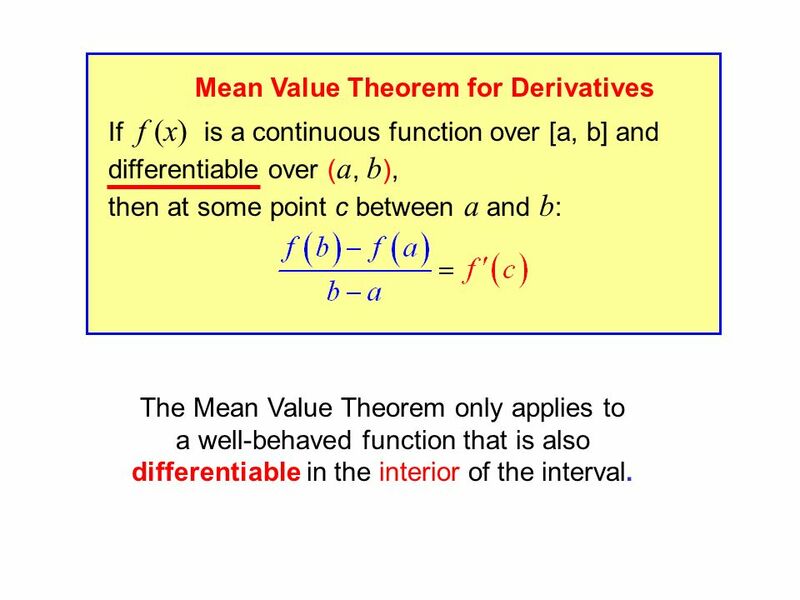 3 If f (x) is a continuous function over [a, b] and differentiable over ( a, b ), then at some point c between a and b : Mean Value Theorem for Derivatives The Mean Value Theorem only applies to a well-behaved function that is also differentiable in the interior of the interval. 4 If f (x) is a continuous function over [a, b] and differentiable over ( a, b ), then at some point c between a and b : Mean Value Theorem for DerivativesThe Mean Value Theorem says that the average slope across an interval equals the instantaneous slope at a point somewhere on the closed interval (where x=c). 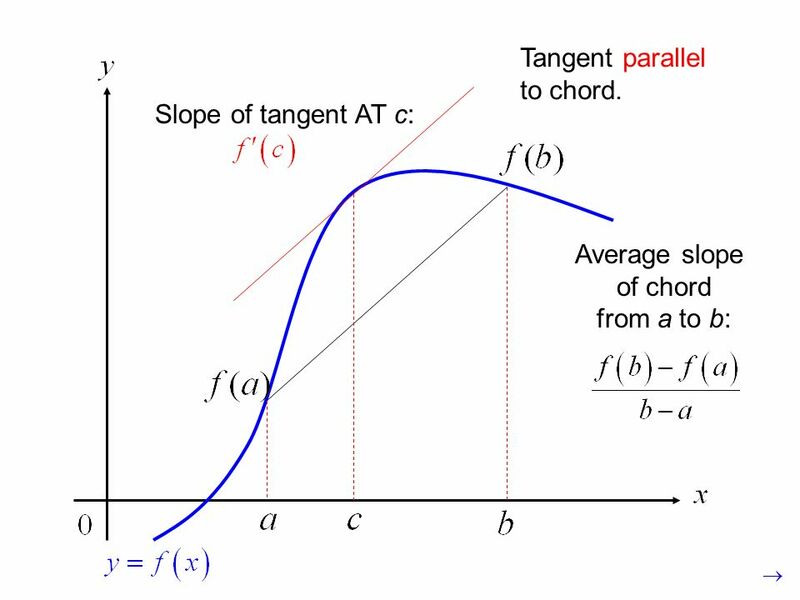 5 Average slope of chord from a to b: Slope of tangent AT c: Tangent parallel to chord. 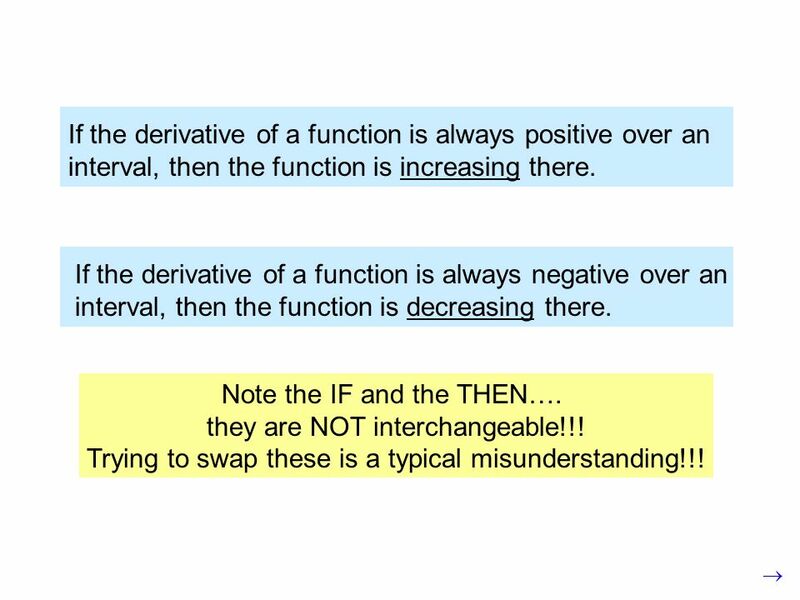 6 If the derivative of a function is always positive over an interval, then the function is increasing there. 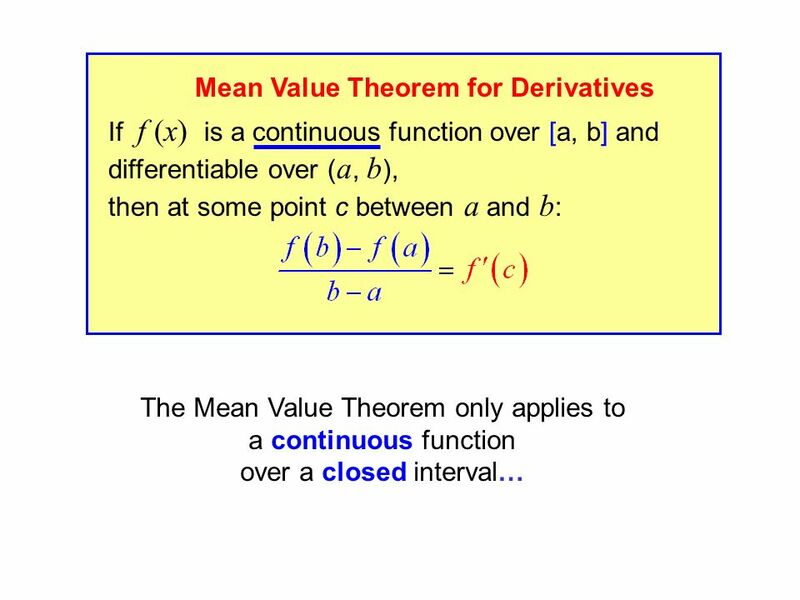 If the derivative of a function is always negative over an interval, then the function is decreasing there. A couple of definitions: Note the IF and the THEN…. they are NOT interchangeable!!! Trying to swap these is a typical misunderstanding!!! 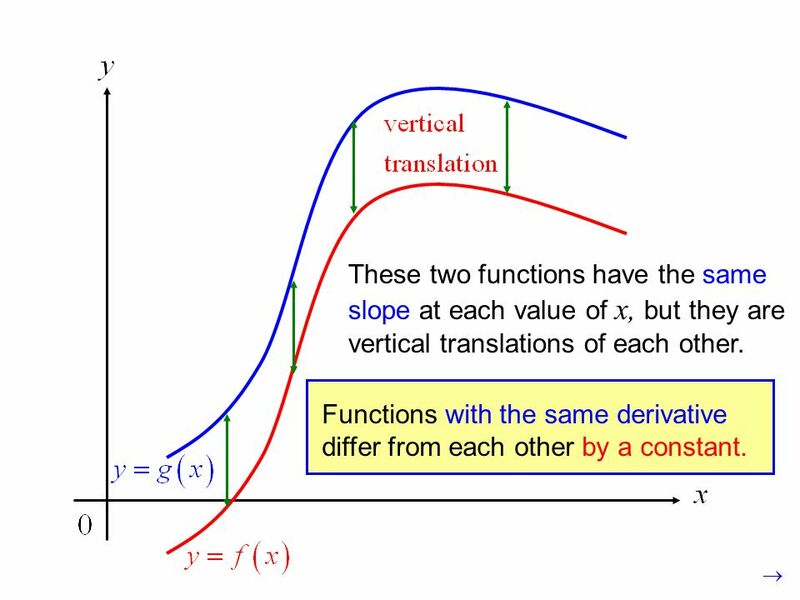 7 These two functions have the same slope at each value of x, but they are vertical translations of each other. Functions with the same derivative differ from each other by a constant. 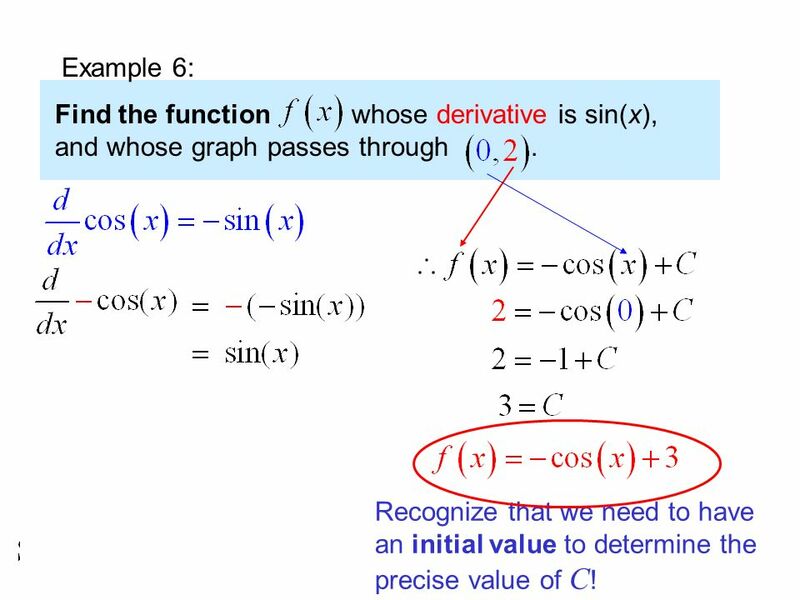 8 Example 6: Find the function whose derivative is sin(x), and whose graph passes through. could be, or could vary by a constant. Recognize that we need to have an initial value to determine the precise value of C ! 9 The process of finding the original function by working backward from the derivative is so pivotal that it has a name: Antiderivative A function is an antiderivative of a function if for all x in the domain of f. The process of finding an antiderivative is called antidifferentiation. 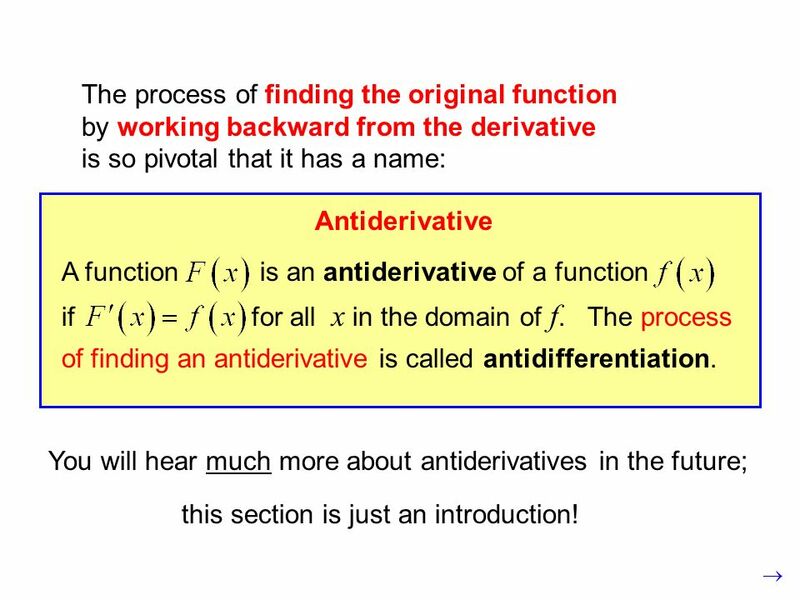 You will hear much more about antiderivatives in the future; this section is just an introduction! 10 Since acceleration is the derivative of velocity, velocity must be the antiderivative of acceleration. 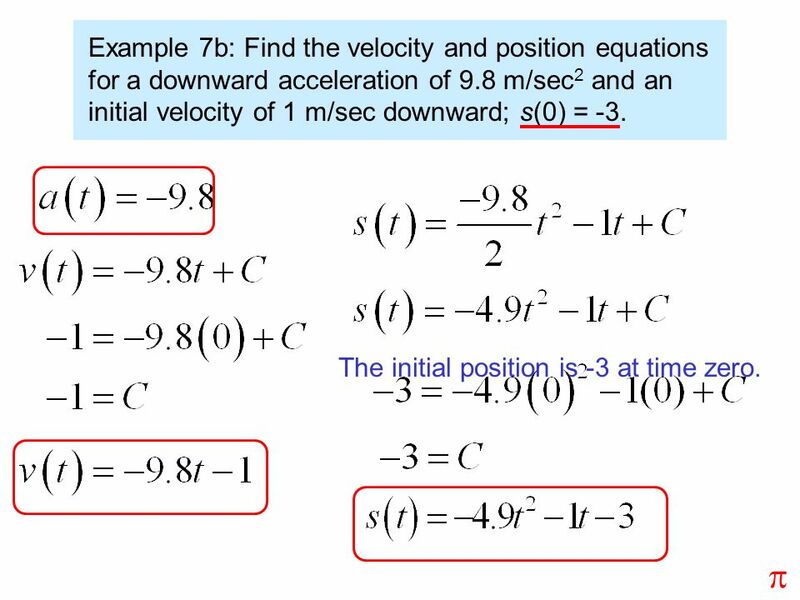 Example 7b: Find the velocity and position equations for a downward acceleration of 9.8 m/sec 2 and an initial velocity of 1 m/sec downward; s(0) = -3. (Let down mean a negative value.) The power rule is now running in reverse: increase the exponent by one, then divide by the new exponent. 11 Since velocity is the derivative of position, position must be the antiderivative of velocity. 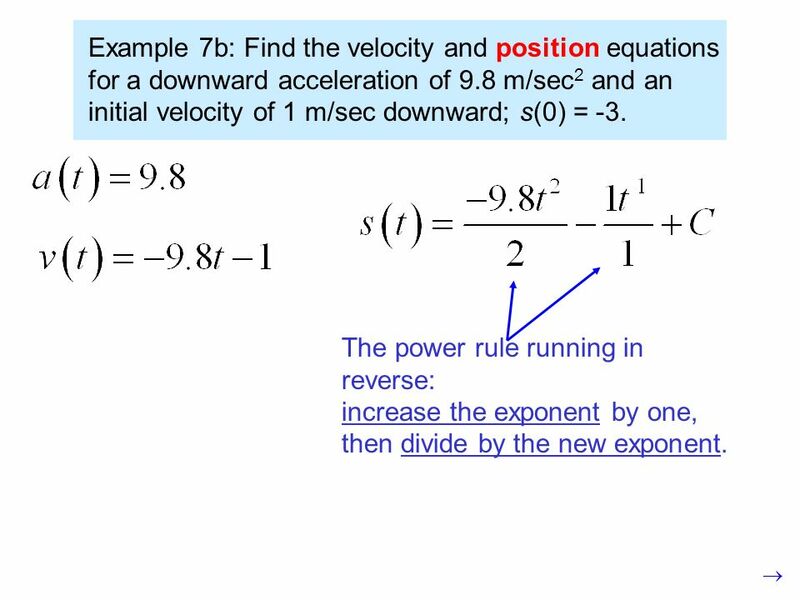 Example 7b: Find the velocity and position equations for a downward acceleration of 9.8 m/sec 2 and an initial velocity of 1 m/sec downward; s(0) = -3. The power rule running in reverse: increase the exponent by one, then divide by the new exponent. 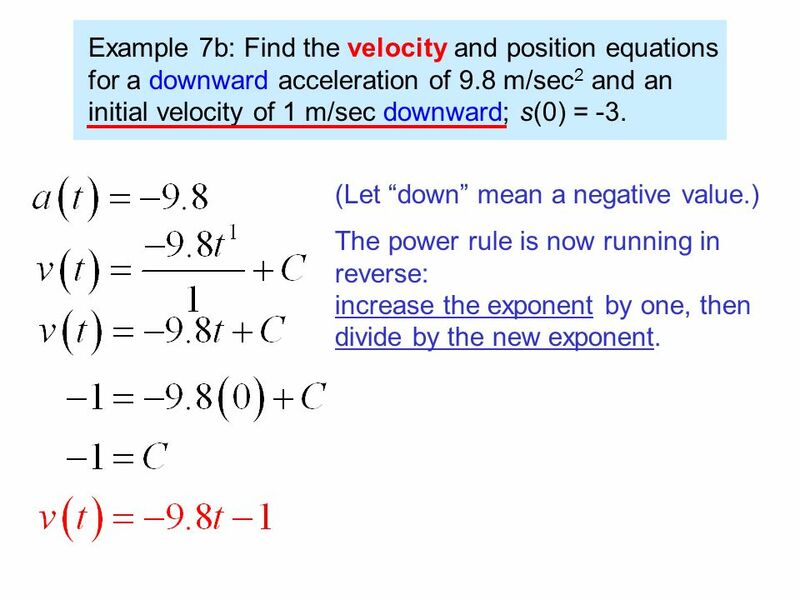 12 Example 7b: Find the velocity and position equations for a downward acceleration of 9.8 m/sec 2 and an initial velocity of 1 m/sec downward; s(0) = -3. The initial position is -3 at time zero. 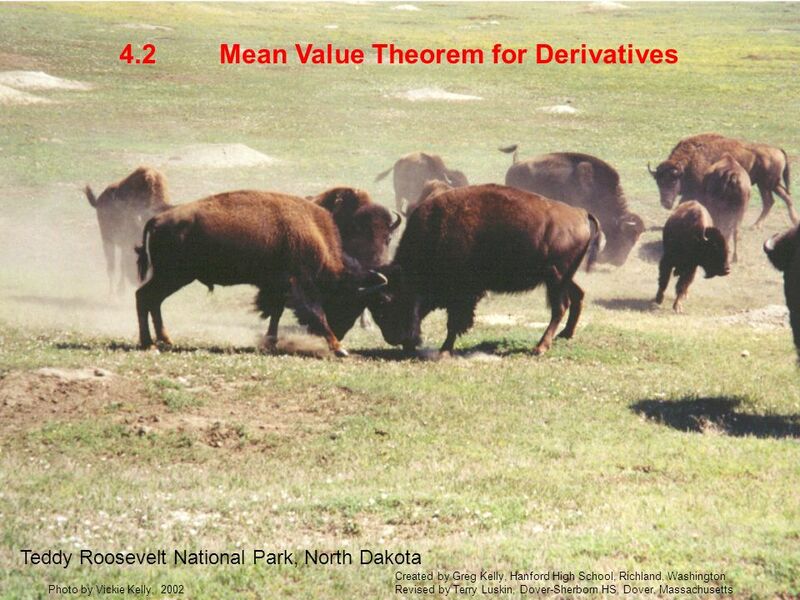 Download ppt "Mean Value Theorem for Derivatives4.2 Teddy Roosevelt National Park, North Dakota Photo by Vickie Kelly, 2002 Created by Greg Kelly, Hanford High School,"
We Calculus!!! 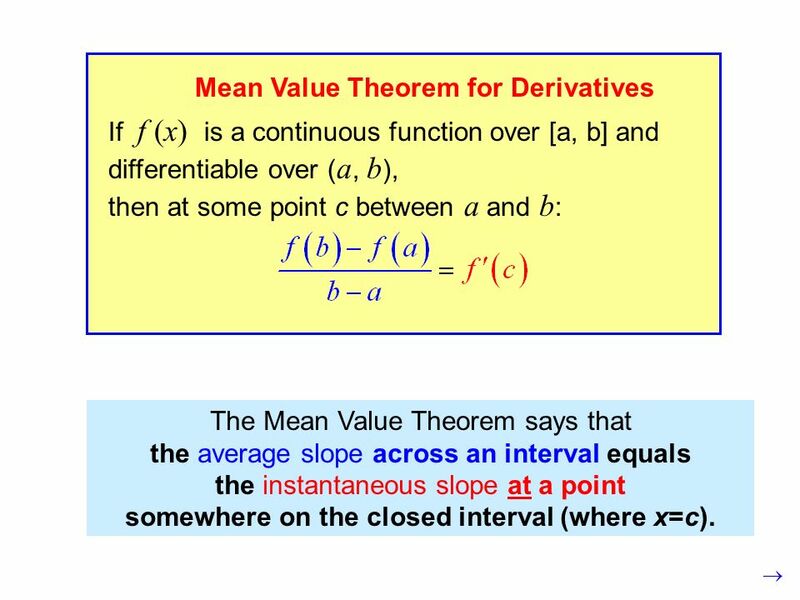 3.2 Rolle s Theorem and the Mean Value Theorem. 3.2 Differentiability Photo by Vickie Kelly, 2003 Arches National Park Created by Greg Kelly, Hanford High School, Richland, Washington Revised by Terry. 3.1 Derivatives Great Sand Dunes National Monument, Colorado Photo by Vickie Kelly, 2003 Created by Greg Kelly, Hanford High School, Richland, Washington. 3.6 The Chain Rule Created by Greg Kelly, Hanford High School, Richland, Washington Revised by Terry Luskin, Dover-Sherborn HS, Dover, Massachusetts Photo. 5.3 Definite Integrals and Antiderivatives Organ Pipe Cactus National Monument, Arizona Greg Kelly, Hanford High School, Richland, WashingtonPhoto by Vickie. Warm Up A particle moves vertically(in inches)along the x-axis according to the position equation x(t) = t4 – 18t2 + 7t – 4, where t represents seconds. 2.4 Rates of Change and Tangent Lines Devil’s Tower, Wyoming Greg Kelly, Hanford High School, Richland, WashingtonPhoto by Vickie Kelly, 1993. The Derivative and the Tangent Line Problem. Local Linearity. 4.1 Extreme Values of Functions Greg Kelly, Hanford High School, Richland, Washington Borax Mine, Boron, CA Photo by Vickie Kelly, 2004. Mean Value Theorem for Derivatives4.2 Teddy Roosevelt National Park, North Dakota Greg Kelly, Hanford High School, Richland, WashingtonPhoto by Vickie. Anti-Derivatives4.2 Revisited. These two functions have the same slope at any value of x. Functions with the same derivative differ by a constant. Rolle’s Theorem and the Mean Value Theorem3.2 Teddy Roosevelt National Park, North Dakota Greg Kelly, Hanford High School, Richland, WashingtonPhoto by. Gottfried Wilhelm von Leibniz 1646 – 1716 Gottfried Wilhelm von Leibniz 1646 – 1716 Gottfried Leibniz was a German mathematician who developed the present.